How did this come to pass! 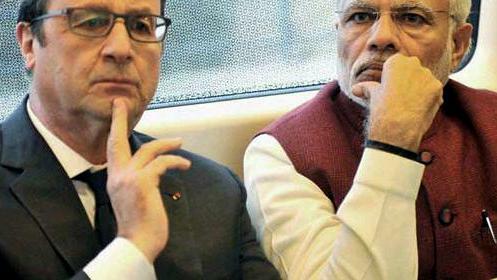 Modi with Hollande. In a shocking development on the Rafale deal fiasco, former French President Francois Hollande told a French newspaper that his government was not given a choice in selecting a local partner for Dassault Aviation, the French aeronautics company responsible for manufacturing the jets for India. Hollande told the publication, Mediapart, that it was the Narendra Modi-led government that had pitched the name of Anil Ambani’s Reliance for the deal. Hollande also cleared the air surrounding media reports that Ambani’s Reliance Entertainment had signed an agreement with his partner Julie Gayet to produce a film just two days before Hollande attended Republic Day celebrations in 2016. It was on that same visit that Hollande sealed the deal with Prime Minister Narendra Modi to deliver 36 aircraft. Hollande has been quoted by an article in French website Mediapart as stating that the Indian government had asked the French government to nominate Anil Ambani’s Reliance Defence Industries as its India partner in the Rafale jet deal. The development comes at a time when the ruling government is under severe criticism by critics and the Opposition over Reliance not having adequate experience to be chosen as the local partner. Ambani himself, in a letter to Rahul Gandhi, said that the government had no role in Dassault picking Reliance. The government has also denied any involvement in Dassault picking Reliance. In fact, it claimed that it was up to Dassault to choose a local partner. The Congress took to Twitter to slam Bharatiya Janata Party’s (BJP’s) claims on the Reliance-Dassault tie-up, calling them a “web of lies”. In the meantime, the Defence Ministry tweeted that neither Indian nor French government had any role to play in the commercial decision. The deal between India and France for the former to procure 36 Rafale aircraft from the latter was signed on 23 September 2016. In October 2016, the joined venture between Reliance and Dassault was announced, with Reliance Defence being part of the offset programme and holding a 51 per cent stake in Dassault Reliance Aerospace Ltd (the remaining 49 per cent owned by Dassault Aviation). The foundation stone for a production facility was laid by Dassault’s Eric Trappier and Anil Ambani under the joint venture in October 2017, two months before the release of Julie Gayet’s film, reported Scroll. The Opposition’s criticism over the Rafale deal has emphasised on preference being given to Ambani’s Reliance over Hindustan Aeronautics Limited (HAL), which was to originally be part of the deal. Soon after the news of former French President Francois Hollande claiming that the Modi government chose Reliance for the Rafale deal surfaced, the Congress tweeted that the BJP’s “web of lies” has been exposed. In addition, Congress President Rahul Gandhi said Prime Minister Narendra Modi has “betrayed India”. The PM personally negotiated & changed the #Rafale deal behind closed doors. Thanks to François Hollande, we now know he personally delivered a deal worth billions of dollars to a bankrupt Anil Ambani, Rahul tweeted adding that the PM has betrayed India. He has dishonoured the blood of our soldiers. Former finance minister Chidambaram said, “the defence minister had been called out again”. Defence Minister has been called out again! This time by then President of France, Mr Hollande. In the NDA negotiated Rafale aircraft deal, we have got no aircraft, we have got only lies. What is the new lie that the government will put out in response to Mr Hollande?